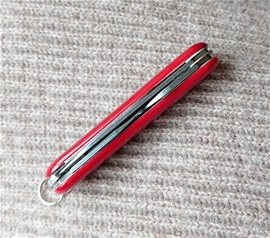 If you follow me on Pura Victorinox on Facebook you can read and see some of my advertising Victorinox SAKs. Today I have a selection of 85mm Wenger advertising SAKs. 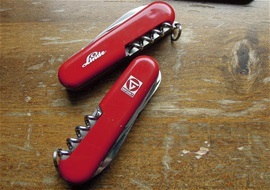 It is the same with them as Victorinox. From time to time I study and collect some advertising knives to learn more about the products and history. Wenger also had its own main-line, economy-line and advertising-line. In the advertising-line Wenger also could use all categories and there are some variations to find. There are profiling markets around the world that also could influence the products used. There are different methods used to apply the scales and advertisings. The methods used to apply the paint and information can have various technical names. What is important is that the advertising and information are durable enough so it will last during use for many years. Surprisingly pad print or color applied on the scales are durable and I have seen knives that been around for a round or two that got the information intact. It is a heavy impression for me when I receive or find such knives because when a Company use and give these to workers and people it is special. The reason for this is simply that when persons receive a quality Swiss Army Knife with the Company name or other on then it gives a strong impression that is good. Today we see a lot of profiling objects used that is not quality. This does not give that quality impression for the receiver. It is different with SAKs because of the factors mentioned and it can be used for many years even if you do not like the advertising or words on the scales. The thing for me is that I usually do not like any commercials on TV, radio or other media. 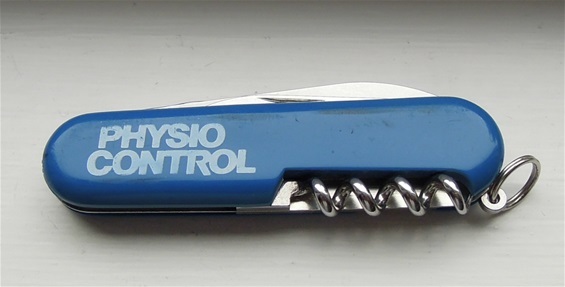 I have absolutely nothing against using or walking around with such on a Swiss Army Knife. The functions can be used in the outdoors or for EDC regardless of any words or numbers used on the scales. The advertising Wenger knives were part of the competition with Victorinox for the world markets in the history. In this history it was not only about making innovations, new functions and following the traditions. 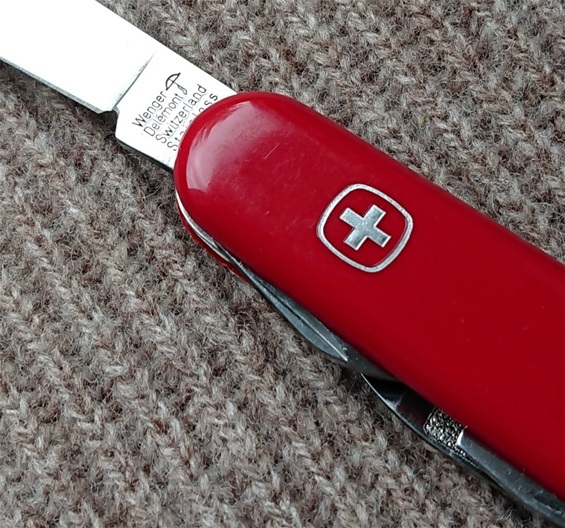 The iconic Swiss Army Knives was known for the quality and history for versatile tasks. This quality and versatile impression was the reason for why many Companies around the world wanted the advertising on it in the first place. It is about showing that their Company was versatile, able and presents quality work. It is the legacy and the quality product people see when they receive it. This is all good in my eyes. In the history of SAKs it was a battle between the two Swiss Companies for the world markets. 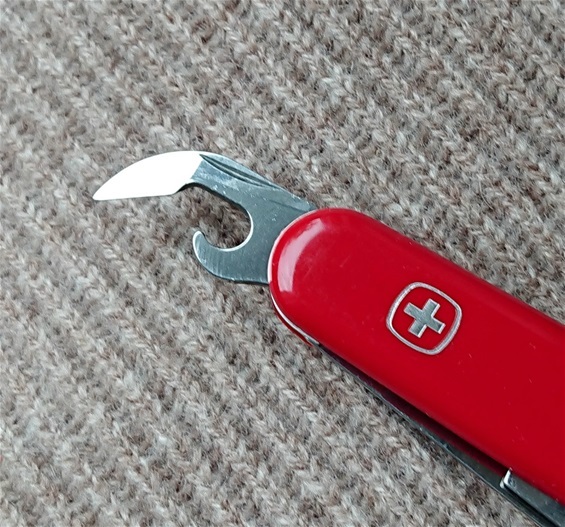 It is only one Company today that can call themselves makers of Swiss Army Knives. 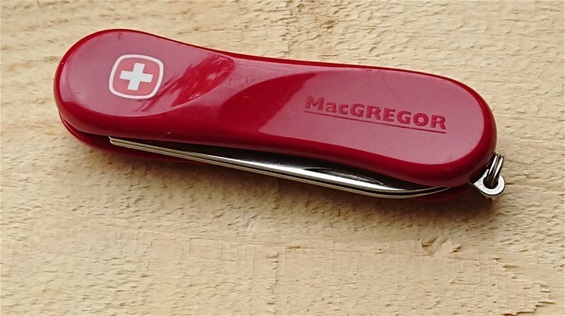 From several parts of the world outside Switzerland it is produced millions of similar and fake products that surprisingly say they are competing with Victorinox for these markets. Most of the knives made outside Switzerland do not have any quality at all and what impression does this give to a person receiving it? Swiza knives is a Brand i like to follow a bit because they got quality Swiss products. This is my latest Wenger advertising 85mm SAK. It got an interesting advertising that I am looking into. The construction of this SAK looks to be the adverting line with the pad printed emblem. These typically used blue color. 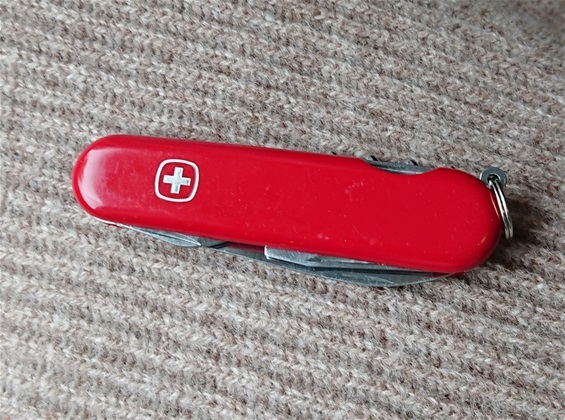 This Swiss Army Knife is in nice used condition. It could not have been used much. This is a market find. It got advertising on both sides and it could be that IVAC is short for a few things. It looks to be a mid-1990s-2000 construction Wenger SAK. This is my latest Wenger 85mm SAK and this is an interesting advertising knife. Wenger had budget, basic and advertising knives. The advertising line is between the economy made knives and main line. 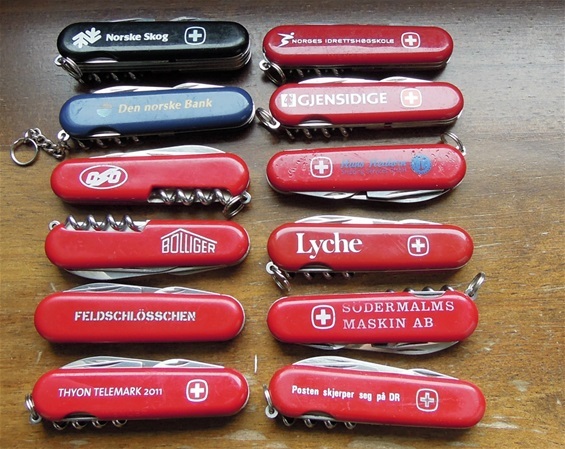 For advertising Swiss Army Knives Wenger used all categories with the Classic category included. They also had a pure advertising line of SAKs like this one I will show today. Because of all the variations in the evolution and construction these can be difficult to date because of many factors. The advertising itself can be valuable and helpful to get a time window. I do not need much information to tell that this SAK itself is 1980-1982 because of many factors. It got the short can opener, there is no lock for the flat screwdriver. There is no W or three knife logo on the backside of the blade tang. The surface and how the functions are looking are also helpful. This knife and complete construction got a bit tighter riveting with strong spring tension. The emblem is hot stamped with silver color. It also got an advertising that is applied with a different printing/paint. The complete SAK is in very nice condition and everything suggests that it is made in 1980-1982. It is always possible that the advertising handle scales was attached a bit later. This 85mm knife does not include toothpick and tweezers. 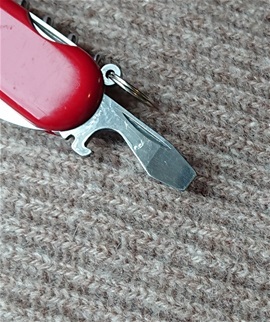 It is possible to find several knives in the late 1980s without locking screwdriver and with short can opener. Around 1988 Wenger made several changes to many parts of the construction. Another thing to have attention to is the tang stamp with the crossbow that looks more modern. The older crossbow had a bit different design. This you can see on the 1970s tang stamps used by Wenger. This can appear during the 1980s. Still I believe that this knife shown today should be early 1980s for date factors. So the next and most interesting detail is the advertising itself. 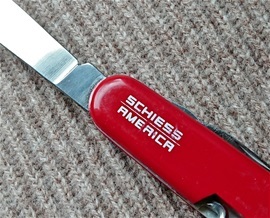 SCHIESS AMERICA. I looked on the internet to see what Company this is. It turns out that this name appears for many different people, Companies and for shooting. It is difficult to find out the origin of this advert. This is also interesting and fun. It can be demanding to find. Perhaps it is a large Company with branches to several countries. Very nice 85mm with similar functions as the Commander. No toothpick or tweezers. Advertising SAKs only had numbers. I wonder if the SCHIESS AMERICA could be for Schiess Distributors Inc. This is a Company that started in 1979. Let me know if you got any information. This Company got a very nice logo with a crossbow and arrows. Further he mentions that the parent Company is SCHIESS AG in Switzerland. I read the history timeline and information from their site. It is interesting in deed. This is my latest Wenger advertising knife called the evolution 81. This is a 65mm category in very nice condition. At first it looked like the color on the MacGregor advertising somehow was worn and that it originally was a different color. Looking on it with a strong magnifier it seems like it is designed to be so. Maybe this could be a bit more neutral in design perhaps. It is a very well-known Company. The evolution ergonomics actually works on such a small SAK too. Thank you very much for the links and information. I really appreciate it.